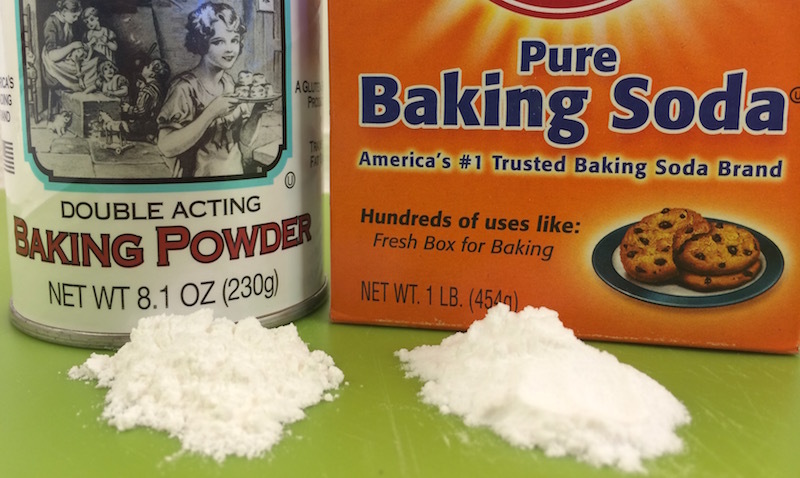 What are the differences between baking soda and baking powder? Baking soda and baking powder, although very similar, are different enough to completely ruin your recipe if you get them mixed up and use the opposite one. Allow us to explain all the differences in both composition and usage of these two white substances that are indeed easy enough to mix up. Before we get into the differences between baking soda and baking powder let’s begin with what’s the same since one, the other or both are most commonly used in making most baked goods. First off, both are white powders indistinguishable to the untrained human eye. Baking soda and baking powder are both leavening agents, which means that they are able to produce a rise in baked goods due to a chemical reaction which produces carbon dioxide gas. To further complicate things, baking powder actually contains baking soda! But, the two substances are used under different conditions which brings us to the meat of the baking soda vs baking powder lesson. Baking Soda is technically Sodium Bicarbonate. The most important thing to remember when using baking soda is that it is a base, meaning that it will taste bitter unless it is combined with a an acid. Baking soda needs both moisture and an acid component in order to force a reaction. When baking soda is mixed with a moisture and an acid a chemical reaction occurs which produces Carbon Dioxide that expands with heat. The rising process begins immediately upon mixing, so it is important to begin baking the mixture right after mixing the baking soda with the moisture. If you don’t, then the rising process will begin and then stop without the quick introduction of heat – resulting in a baked good that falls flat! Common liquids that are mixed with baking soda to begin this reaction include (but are not limited to) yogurt, melted chocolate, buttermilk, honey and molasses. If you omit the acid, your cookies will taste bitter and quite possibly be inedible. The alkalinity also enhances browning reactions which add color and flavor. Baking soda is generally called for in cookies. Baking Powder is comprised of Sodium Bicarbonate, Cream of Tartar (an acidifying agent) and starch (a drying agent). Baking powder comes in both single acting and double acting formulas. Single acting powder has a single reaction when moisture is introduced and then must be baked immediately. Double acting baking powder has the initial reaction with some carbon dioxide being released upon moisture introduction and then another stronger reaction when heat is introduced. Most baking powders are now double-acting, making recipe results lighter and fluffier than recipes calling for just soda. Because baking powder consists of both an acid and a base, the result is a neutral taste. Recipes calling for baking powder generally also call for other neutral ingredients as the liquid, for instance milk. For the lightest cakes, you will also want to bake right after mixing. Baking powder is usually called for in cakes and breads. Since baking powder is different than baking soda, you should also learn how to substitute one for the other should the need arise. To substitute for baking powder, see this post and to substitute for baking soda, see this post. To find out how long baking soda lasts, check our baking soda page. To find out how long baking powder lasts, check our baking powder page.